An obvious homage to Gary the Snail from SpongeBob SquarePants, though I do think playing up on the in-game reference below is more awesome. This is for all the wipes in the Throne of Thunder sewage to the now infamous Gastropod. TAKE THAT, YA DIRTY SNAILS! Jerry the Snail, also known as the replacement snail when Spongebob thought Gary loved patrick more. Anyone know how to obtain this item? This just dropped off a Gastropod for me. This was my first time in that LFR on any toon since 5.3, so not sure how common it is yet. You can control him for about 60 seconds. Vanity item thats BOA? When are they going to make the others like this! Run it over a non-combat pet to cause LFR flashbacks. 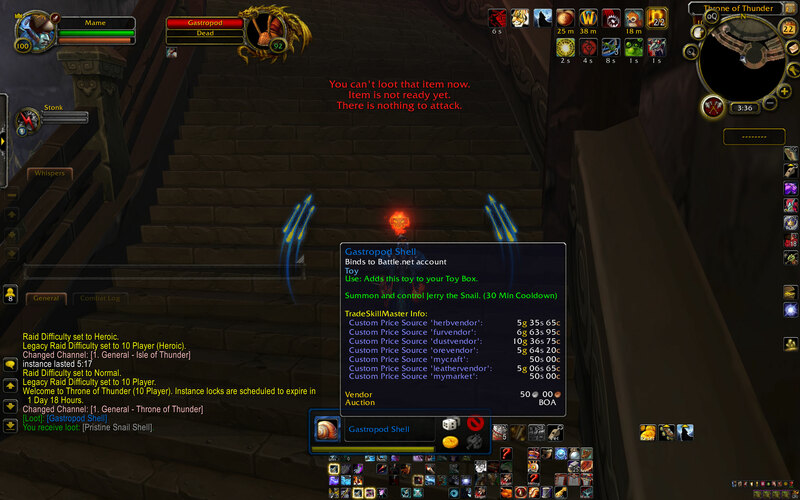 It says it only drops in 25-man Heroic Throne of Thunder, but it can in fact drop from all difficulties, including LFR. Don't know why Wowhead says it only drops in 25 man HM. this just dropped for my raid team in 10 man HM. This just dropped in our LFR. You turn into 'Jerry the Snail' and are able to control him. Currently farming this on my hunter. Have some people help you out by getting up to Meg down (DO NOT kill Ji-kun). The hardest part is the two packs of flies that you are forced to deal with, as they have to be burst down as hard as possible before they end up killing you. Other than that, it seems there are two bore worms at the last snail area that you have to kill, but feign death can fix that if you're lucky. If you really want to make it easy you can also easily kill the first spider. As for the snails, they are the easiest. Just kite them all the way through Meg's area if you have to. Once you've killed the few snails that are in here, an easy way to reset the instance is just to die and reset as a ghost. Once you walk back in, you'll be placed right at the entrance to the snail area again. Just adding that the cooldown seems to be specific to each character -mailing this item to an alt will not reset it's cooldown if you mail it back. Just pointing out that this item is not a personal loot item. It dropped in LFR this week and I had to roll against 24 other players, which I ended up losing (my usual luck, I rolled a 10). A little trick for farming these: As a range, just hop on the little pillars. The snail will fixiate you, but it won't move. Got it in 10N after 264 kills. I improved my solo strategy over time. You only need to kill the second fly, so save your CDs for it. Let the first one fly by, then just run past it to the first snail, kite him up the stairs, if your DPS is lacking and you run out of room, just go around the snail and go back down. As long as you have the snail hug the wall, there's plenty of room to not get eaten alive. For the last two snails up at top, let them patrol close to you, then hit the closest one, run down stairs until it focuses you and you won't aggro the maggots, then immediately run back and aggro the second one (to save time so you don't have to wait for it to patrol again) and run back down. I was killing about 5 snails every 7 minutes with this strategy. Took me 265 kills to get mine. Here is what it does. When you use it, the snail appears in front of you which is in autowalk mode and cannot actually stop. You steer it as if it were your own character like a priest's mind control. It will kill any companions it runs over, including your own. Kills critters too. Also, it will even eat children! As in the Argent Squire companion pet. But perhaps it's most OVERPOWERING use is that it can make the Toy Train Set invincible as long as you're doing doughnuts on top of the tracks! it will eat Wind-Up Train Wrecker and Lil' XT TOO! The only 2 means of removing a train. Unfortunately after further testing it seems that even though you can kill the wrecker, it usually get's it's attack off anyway. Still, it's better then nothing. OK, so just saw this drop in a 5man TOT reg.. saw that u can grind the snails right before Jin kun for it..I went on my 560 ele shammy and had someone join the group then logout.. i entered(with lockout after Magera but before Jinkun) and kited and killed the 2 flys and the 5 snails.. I only killed 4 the first time.. then died and rest all instances.. the 2nd time i killed 3 and when i pulled the 4th the two bore worms pulled and i died,. (re-encarnated) then aggro'd 4th snail and killed it.. then BOOM it dropped! :} only took 8 snails total.. so must be super lucky or they upp'd the drop rate. GO get it! so worth it. Farming this on my 582 ilvl Ele Shaman made it really easy. Set hearth to Thunder Isle and glyph Astral Recall. Was doing full runs in 5-6min. Not much point in doing them faster as you'll have to wait on hearthstone or astral recall. Anhk comes in handy if you space out or accidentally pull the 2 bore worms. As others have posted skip the first fly swarm. I found that every time I ran in I could follow the first fly swarm up the ramp and hug the right wall and would not aggro them. That would leave just enough time to pull the first snail with ascendance, kill, recall totems and run up ramp to dodge the fly swarm pat. Pull and kill the next snail while kiting it down the stairs. The next fly swarm I would just dps down from the ledge (don't get in melee range) and would only drop one healing stream totem after I lost about 25% of my health. Don't move and just pull the next snail and dps him till hes close and then jump down to where u killed the fly swarm and he stops coming after you, finish him off. The last two snails you can usually pull at the same time. When they are closest to the top of the steps pull one and quickly run back down the steps to where the last fly swarm was (to avoid pulling the two bore worms). Once they get close to you, jump back down to where u killed the last fly swarm to stop the snails movement again and finish them off. Feel free to pop lust, stormlash and ascendance on this pull. If you pull a fly swarm up top just drop healing stream/tide or AG as needed till you kill and loot snails. I tallied up all my Ji-Kun kills to see how many times I killed the 5 snails before I started solo farming and got 410 snail kills. Got it to drop on my 365th solo kill (yes it was the last snail of the run :P) So 775 total snail kills before I ever saw one of these drop. Yes it can drop on any difficulty. Good luck! Just got it after 347 kills in 2 days gastropods farming. Farmed it with my combat rogue (587ilvl). Used glyph of evasion, cloak of shadows and recuperate (recuperate not neccessary). Talents: Shuriken Toss, Burst of Speed, Leeching Poison. First i killed the flyers with evasion, killing spree and ar+sb, if damage is low use cos after evasion falls of and the flyers do their cast (immune it). Then kite and melee the 1st and 2nd snail. Do just the same with the 2nd flyers as with the 1st. Then kite the 3rd snail a bit down (u can use the grid to bug the snail, so u dont have to kite, just jump off into the water if the snail is on the grid). For the 4th and 5th snail i used vanish to reset the worms, because the fixate of the snail wont drop off. Just let them come a bit near, then use vanish and after worms reset, hit the snail again (if u have to wait a bit for the snail just use evasion to tank the worms and then use vanish). If they're down undress your character and die. You can reset the instance as ghost and just go in again. 1 run took me about 6-7 minutes. Has anyone attempted this since 6.0.3? I'm at 850 kills and starting to believe this item is no longer dropping due to a bug. Got mine yesterday. I wasn't counting kills, i counted my runs (trash resets) when i was farming it, took me 12 runs (must be around 55 gastropod kills). Yes you may think i was lucky. Before i started "teh farm" i was raiding ToT for ages (normal/hc/LFR) never ever seen a single drop though. So it was waaay more than 55 kills in total, especially if i'll count in all alt kills. -Yes it still drops from gastropods in ToT and drop chance is really low so you have to relay on your luck and patience. -I suggest you farm it on range dps character, choose some survival talents and glyphs to survive firefly damage. -You can reset trash. You cant reset trash in raids (and hc dungeons). *Blizzard is changing something almost everyday since start of 6.0.2, so it goes for lockout system as well. At this moment (07/11/2014) we can reset raids and hc dungeons. I did it this way: I am shadow priest with 10k~ dps which is pretty much enough there - all i had to care about is firefly damage (since 6.0.2 patch shadow priests got less healing). I found some ToT 10N pug, cleared all until ji-Kun then left group, after i just kept this raid lockout extended. Since reseting trash in raids by pressing "reset all instances" was unavailable at that moment i was killing all gastropods until Ji-kun (5 pods) then logged out for 40min-1hr - this time is enough for trash to respawn. So basically i killed 5 pods once an hr~. P.S. First week (i cleared bosses to Ji-kun on 10N with pug then left group) i had lockout issue - i wasn't able to farm pods cos pug guys killed Ji-kun and further and somehow we shared raid lockout like if it was mythic, so i had to skip first week. Hope it was just a single bug and ToT normal lockout doesn't work like this nowadays. I just wanted to note that I was able to reset the raid repeatedly. I had some guildies help me clear Maegara and then I took my toon out of the raid. After this I just keep extending the lock each week and when I feel like farming, I do. So far I've been running out because I'm cheap, lol. But it would definitely be worth killing yourself if you don't mind the repair bill because it's a darn long run! I use the "reset all instances" button and re-enter. For me, it never says "Throne of Thunder has been reset" but I went back in to check and the trash HAD re-spawned. Edit: When I pull the snail the bore worms come every time. After reading Nocta90's post I dismissed my pet and pulled the snail. As soon as the bore worms got close I used Feign Death to reset them and the snail did not reset. Remember to move back enough after the pull to allow you time to wait for the worms and reset them without letting the snail get close enough to kill you. Because he will, lol. Edit 2: Due to a weird glitch/bug today my instance lock changed to heroic mode lock. Not sure how as I was alone and am certain I didn't do it accidentally. When it changed to a heroic mode lock, I could no longer reset the trash. I just had to wait about an hour and a half each time for it to re-spawn:( I've noticed there are an equal amount of players saying that the trash does or does not immediately re-spawn on this page and the one for guide to farming the shell.. My experience today has me wondering if the people who can NOT reset the trash are using a heroic lockout? I would like to confirm that this item drops in all difficulties. After killing about 800 Snails, I started to give up, thinking it would only drop in heroic or 25-man. But on the 806th snail it finally dropped. I was close to giving up, and focus on Warlords instead, but it dropped just in time (one day before the release). So yeah, for all toy collectors, don't give up your hopes, it STILL drops (6.0.3), and my guess is that it will continue to drop in Warlords. Dropped today. Looted about 500 to 600 snail shell, good indicator of how many snails you have killed. Killed it on 10m normal. When you are done killing the 5 snails (5 per run) switch to heroic, then click "leave instance". It teleports you outside the raid. Switch back to normal 10m then do a soft reset and voila your back in. You get locked out about 10 times per hour (just a guess, only got locked out twice). I was grinding it on and off the past 2 or 3 days. Don't give up, it will drop! dropped for me yesterday after about 12 resets, so yea, it does definitely drop. 10man normal. It doesn't list that it drops in N25 man, but I can confirm that it does since I got mine today after 346 kills. It shown up first in the loot list along with a snail shell when mine dropped. Just some other info, I joined up with a pug on N10 man and dropped out after we killed Megaera. At first when I entered back in, it would always put me back in that lockout, but I would just leave. I ended up switching it to N25 man and started farming the Gastropods in there. You have 2 options on how to get out to reset the raid. 1. You can use Kirin Tor/Sunreaver Beacon and just run back each time. 2. You can change the difficulty to Heroic and choose "Leave Instance" and it will port you right outside the raid and then just change it back to normal mode and repeat. The N10 man version I was in originally, finally reset and it would let me farm just one set of them. The switch to heroic method will get you out, but if the raid you were in continued on and killed any more bosses, then you will have to continue on the other difficulty until it drops or you run with another group that stops after Megaera is killed. The trash will only reset after so much time has passed on your main raid lockout. It still stays that way even when extended into another week. Here is what I did to fight them as a hunter. I did this without a pet since they will just get killed when they get near. Modify this based on the class you are playing as, if possible. When you enter, avoid the spider web that is on the ground and watch the path of the bow fly swarm that flies through too so you can avoid them. Pull the first one and just kite it up and down the stairs as needed. Watch out for the Gastropod at the top of the stairs while you are fighting the first one. Make it hug the wall so you can run around it while you hug the other wall to turn it around. Repeat until it is killed. Repeat for the second Gastropod at the top of the stairs. For the third one, Just avoid the stationary bow fly swarm that is part way up between the two sets of stairs. I always pulled it from the right side of the room making it take longer to path to me. It won't pull the bow fly swarm at all unless you use some kind of aoe attack while it is near it. You should be able to just work your way down to where the first Gastropod was and use the wall hugging method if it is not dead by then. For the fourth and fifth Gastropods, I always stood on the right side near the top of the stairs on the corner, left of the spider web and waited for them to path close enough to be in range. Once you attack either of them, back down a bit so you are out of LoS of the bore worms. Let them pop out of the ground and wait about 2-3 seconds to be safe then you can move back up and continue attacking w/o having to worry about pulling them. Just pull them down the right side and fight them back to the first spawn point. If both happen to be nearby and you are comfortable fighting #4 and #5 at the same time, just pull one, step back then move back up to pull the 2nd one if close enough, step back down again and kite them both down the stairs the way mentioned earlier. If for some reason they are evading your attacks, just kite them down the stairs to the first spawn point then turn it around. When it fixates again, it will become attackable again. You can't feign death, shadowmeld, etc against them afaik. They keep moving towards you until you kill them or they kill you. Have patience and Good Luck. Hope some of this info helped you. This dropped for me farming solo in 10 man normal difficulty after 69 recorded Gastropod kills (Rarity addon). To be able to farm this most efficiently solo first thing you want to do is secure your Throne of Thunder lockout with all bosses dead up to Ji'kun showing on raid info - this can be accomplished in a group provided you leave after Megaera (hydra boss). It is better and easier if you do whole run on normal difficulty to prevent additional complications with instance lockout later on. If you've just done other bosses in a group and left raid you will need to wait about 30 minutes before you enter again to start solo farming as you might run into "you are not in this instance group" message and get kicked out in a minute every time you enter. If you want to do this in 10 man normal repeatedly you have to be grouped for it to work (grouping with any other character which can be offline once in party will work if you have your lockout and are a leader), If you are not grouped with someone you will keep getting into heroic lockout when entering regardless of how many times you change it to 10 man normal and reset instance and the only way to get back in normal lockout (which is important so you can exit the raid with one click to keep up continuous farming) is if you change difficulty to 25 man normal, but then Gastropods will have 3 times as much health. This might be acceptable to level 100 players but it was not for my level 90 rogue who then needed 2 minutes to kill one in 25 man as opposed to 30 seconds in 10 man. The other way you can do this without bothering with a group is by waiting for certain time to pass (I've never done it myself but knowing how resetting other raids works it's 30 minutes exactly, other people in comments made estimates ranging between 40 minutes and 1.5 hour) if you don't mind doing this only occasionally and don't plan to continuously farm for it in one long session. So does anyone know any way to reset the instance nowadays? I find myself unable to do so whatever advice or guide i follow. 0. Invite a friend or alt to party, they dont need to join in on the raid or even remain online. 1. Kill your way up to and including Megaera on normal difficulty (DO NOT kill Ji-kun). 2. Kill the 5 Gastropods. 3. If the 5 Gastropods don't drop the toy; while out of combat, set the raid difficulty to Heroic. 4. A prompt will pop-up asking if you're ok with the previous 5/12 bosses being defeated. Choose Leave Instance. 5. Now that you've been kicked outside of the Raid, Set the raid difficulty back to normal and choose reset. 6. Finally, re-enter the raid and repeat steps 2-6 until toy is acquired :)! There are five Gastropod NPCs on the way to Ji-Kun, and based on the drop rate listed on this page, there is approximately a 1/125 of any given Gastropod dropping a Gastropod Shell. Ji-Kun, on the other hand, has approximately a 1/100 chance, per kill, of dropping the mount: Clutch of Ji-Kun]. Without specifically farming for the Gastropod Shell, clearing the trash for 100 Ji-Kun kills (which only nets you a 63% chance of seeing a Clutch of Ji-Kun) will mean killing 500 Gastropods in total for a whopping 98% chance of seeing at least one Gastropod Shell drop. Therefore, if you want Clutch of Ji-Kun, and are capable of soloing Ji-Kun on multiple characters a week for it, you will most likely get the Gastropod Shell long before you see the mount drop, and you would most likely be wasting your time by specifically seeking it out. After all, by the time you get your Clutch of Ji-Kun, you may have gotten another Gastropod Shell along the way! Then again, if you really want that toy and don't want to wait, go ahead and farm away. A hundred Ji-Kun kills is almost two years of consistent farming for those of us who don't run alts. Nice! I did it in about 2.5 hours on my alt Hunter. 1. Friend with ToT10 save to Ji-Kun invited me. 2. Went in, he made me leader and then logged off. 3. Killed the pods, right clicked my portrait and set to Heroic. Pressed "Leave" on the confirmation screen to instantly port out to the instance entrance. 4. Right clicked my portrait, set from heroic back to normal and walked back in. Didn't have to reset or anything and the leader didn't even need to be online. Nice! Finally the toy dropped for me today. Well I did not farm it directly but i run the raid every week for the mount which drops from Ji-Kun and from Horridon. So my advise is just to run the instance every week when you also want to have the mounts. Hopefully in the meanwhile the toy will drop just like it dropped for me. I totally runned Throne of Thunder 29 times. It dropped on run 29. So i killed about 145 snails. Obtained after about 150 snail kills. However, that is the number i farmed for it solo in WoD. Back in MoP, I cleared that place about 70(x5 snails per run=350 snails looted) times, both heroic and normal, and only saw it drop once. The easiest way to reset the instance to farm the trash snails for this is to start a "Realm Hop" group and convert to raid when someone joins. From there, when finished killing the five Gastropod in normal, you can set to heroic, decline to port out, set to normal, reset instances, enter, and repeat. No online friends necessary; the open Realm Hop group-finder keeps you in a raid. Getting really damn tired of my luck... at best I occasionally get average luck on one or two things, and the rest bottom of the barrel 98/99% worst percentile luck for every rare drop. Jerry is such a nazi, why does he always end up drawing swastikas? Farmed at least 300 snails on/off over the years. In more recent times about 200-300, and it dropped when I switched to normal10. With proper class choice etc, you can do 1 run every 1:50-2½ min. 2. Clear the Raid through Megaera on NORMAL. DO NOT kill Ji-kun, if you do this will mess up the trash. 3. Kill all 5 Gastropods, should you be unlucky and not get the toy, proceed to step 4. 4. While out of combat, switch the raid to Heroic. 5. When the prompt about 5/12 bosses being defeated pops up, choose "Leave Instance". 5. Once you are kicked out of the instance, set the raid back to NORMAL, then RESET all instances. 6. When you reenter the raid, you will be spawned in front of the sewer tunnel for the gastropods. Rinse repeat until you get the toy. Note: After some time your group will be terminated from "inactivity", if this happens just remake it. If you forget and enter the raid while not in your private group, and it's still set to heroic, just port out when the prompt pop up, remake group, set to normal again, reset, and go back in, and it should be fixed. If you are unlucky like me on this run, you'll probably run into the "too many instances" just switch to an alt, or go stretch your legs for a little while. I generally give it about 30 minutes, then go back. After weekly reset I cleared 25 normal (because I still need some appearances and 25 man drops more loot) on 10 alts to 5/12 or with words, killed also 5 Gastropods and never jumped on Ji-Kun's platform. When I got there I switched heroic, leave instance and parked my alts outside and did the same with another. After I cleared ToT on 10 alts I could log 1 character after another (2 clients to save log out time). I would be ported in the cave right after Megaera before the corridor where wild Gastropods appear. So I repeated this on 10 characters which would get me to 10 instances per account limit in 30 mins. Then I would log my main and do something else, like farm Talon's Vengeance or something ;) And repeat the process in a little over 30 mins. Using this method I obtained Gastropod Shell just now, after ~400 attempts. Half of them done on heroic ToT (in the past), half of them done on 25 normal from this farm and a few done in 10 normal because I had 1 alt who didn't need appearances anymore and was doing it on 10 man. I obtained it on that alt on 10 man normal. lol here I am short 1 mount on a mount collection achievement and unlucky with mount drops only for this thing to drop on my second kill.